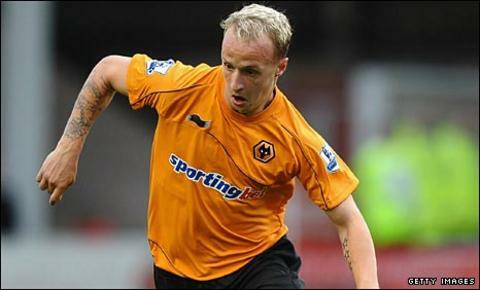 Hibernian have confirmed the six-month loan signing of Wolves striker Leigh Griffiths. And the 21-year-old, who left Dundee for Molineux in January, will be available for Sunday's Edinburgh derby. "I'm a Hibs fan but I didn't sign because of that - I view this move as being good for my development," he told the Hibs website. "I'm keen to prove myself in the SPL by scoring goals and the fact I get to do that for Hibernian is an added bonus." Leith-born Griffiths was associated with local club Hibs as a youth before starting his senior career with Livingston. He was sold to Dundee for £125,000 in 2009 and, two years later, Wolves paid the financially stricken club £150,000 for the Scotland U21 international. Griffiths made his debut for the Barclay's Premier League club as a late substitute in this week's 4-0 Carling Cup victory over Northampton Town. Hibernian manager Colin Calderwood, who signed full-back Richie Towell on loan from Celtic on Thursday, said: "I'm delighted we got him. "He provides another goal threat to our attacking arsenal and he was desperate to come. "He has got good pace, is very deceptive in the air and he is a proven goalscorer."